Look, sometimes you just want to make spaghetti. It’s easy. Throw pasta into a pot. Boil it. Upend a jar of sauce on top. Toss it in front of the animals in your salon. Walk away. Then at other times you’re more willing to make a beautiful, Martha Stewartian homelife for your family. Even the Perfect Housewife, however, can still throw jar sauce on the table with a little bit of extra work. My mother calls this “freshening” the sauce. I think of it as just using the jar sauce as the tomato foundation of a really good meal. Sautee the onions, garlic and sausage meat. 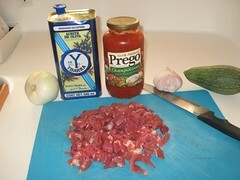 If you have links, you have the choice of squeezing the meat out of the tube or slicing the meat after the links cook. Both methods taste good. Your family doesn’t really care. When everything is nicely soft and cooked, dump in the sauce, basil, and vegie. Slap a lid on and simmer for a few minutes. You can turn this off and set aside if you need the burner for pasta water. Serve over a pound of cooked pasta, any variety. Note: If you are not already making multiple use of your pasta water, now is the time to start. While boiling pasta, you can hard boil eggs or boil root vegetables for the next day’s meals. 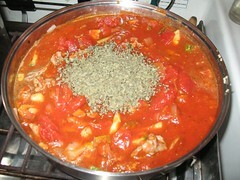 You can also pour off used pasta water to use in poaching or steaming fish and vegies.